REMEMBER: Previous Focus on Finding Failure students are always invited to return to a FFF class as a refresher opportunity for HALF PRICE! Just call us on the numbers below! As an HVAC contractor, you can stop copper embrittlement, and you face it every day and it is ruining your client’s HVAC equipment. But most contractors don’t even know what it is. Sure, they see burnt wires, but they are almost all missing the embrittlement failure related to those burnt wires and how to locate it. In the FOCUS on Finding Failure Advanced Class for Heat Exchanger Inspection Training, each technician will learn how to increase their ability to be truly focused on finding failure to incredible levels. This is a hands-on ‘tech teaching tech’ workshop on greatly increasing your abilities at finding failure using the Inspector™ camera. You’d be shocked at how many times you are letting failed heat exchangers go undiscovered when you do a furnace inspection! You need to stop throwing business away and at the same time decrease your company’s liability. Find far more (legitimate) furnace failure. This Training Will Change the Way You Do Business… Forever! Many HVAC contractors feel that they’re doing “okay” in the safety inspection of their customer’s furnaces and air conditioners. But even among those who are good at it, there’s room for improvement. For many companies the answer is the Inspector™ infrared camera and the training provided by Shamrock Industries, Inc. (an industry leader in heat exchanger safety). This is how they improve their ability to find furnace, air conditioner, and even IAQ failure each and every time it exists. Highly trained technicians are more likely to be more precise and in-depth in their assessments of the customer’s HVAC equipment. This translates into more thorough inspections of equipment and finding more existing problems. Much like doctors, our technicians should be highly trained and thorough with their diagnostic skills. With this in mind, Tom O’Connor and “The Power Team” have joined forces to offer an in-depth training program to HVAC contractors. This training will exemplify new and innovative ways the Inspector™ camera and all the new features, such as Macro Imaging and DVD creation, will allow technicians to properly and productively use the Inspector™ to its fullest potential. The training will include hands-on demonstrations utilizing dozens of furnaces, evaporator coils, and IAQ inspections within an actual training environment. Find Furnace and Air Conditioner Failure Where and When it Exists…Take Your Abilities from So-So… to Sensational! HVAC technicians will learn to become Focused on Finding Failure. Each technician will greatly increase his numbers of generated equipment leads in a very ethical way. Technicians will come to understand that they each have a solemn responsibility to the client to make a completely accurate assessment of the condition and the safety of their HVAC equipment. No more walking away from opportunities to serve your clients! Technicians will locate FAILURE 99.9% of the time if it exists, instead of only 50%. Technicians will learn how to powerfully communicate their findings. Technicians will become proficient at discovering tremendous IAQ opportunities and be able to offer real solutions. Technicians will NOT enter a client’s home as a selling tech, but rather a true professional technician that can offer real-world solutions when discovering problems within a client’s system. Tom does safety seminars on furnace heat exchanger failure on a national basis. In addition to being a national trainer for the AirTime-500 Group and the One Hour HVAC Group, some of Tom’s clients have been R.S.E.S. and A.C.C.A. chapters. 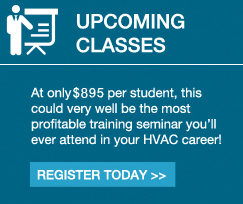 HVAC distributors also host his training seminars. Tom has authored a total of seven books on furnace heat exchangers and HVAC related subjects. And best of all, he has trained hundreds of technicians across the USA and Canada and found a minimum of double the amount of furnace failure than even the best of them had ever found in the past.